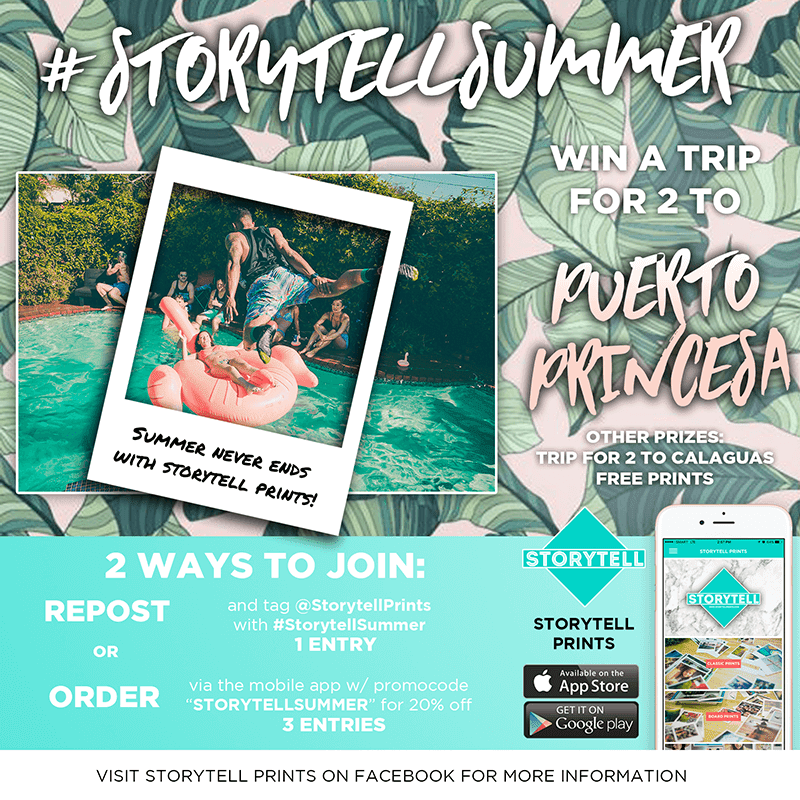 Storytell Prints Announces #StorytellSummer Campaign, Win FREE Prints And Trips! Home / apps / raffle / storytell / Storytell Prints Announces #StorytellSummer Campaign, Win FREE Prints And Trips! Storytell Prints, the newest social printing app designed to tell your story on photobooks, classic prints, board prints, magnets, premium canvass wraps, large format prints, and grid posters has a new exciting promo. Dubbed as the #StorytellSummer, Storytell will be giving away prizes like FREE prints, a trip for 2 to Calaguas worth 10k (in partnership with Bookie PH) and the grand prize: a trip for 2 to Puerto Princesa worth 20k (also in partnership with Bookie PH). 1. Repost the ‘#StoytellSummer Campaign Poster’ through your Facebook and Instagram accounts, tag @storytellprints, and use hashtag #storytellsummer in your caption. Post must be in public. One (1) Repost = One (1) Raffle Entry, multiple reposts in one day will merit only one (1) raffle entry. Repost on different days to gain more entries. For the complete promo details, mechanics, and terms and condition, visit Storytell Prints on Facebook. Storytell Prints is also available for download on both Apple App Store and Google Play for FREE.